Western part of Rajasthan lies in Thar Desert which is prone to frequent droughts and acute water scarcity. The rainfall in the region in less than 200 mm in a year which is insufficient for massive agriculture and recharge. There is acute shortage of drinking water as a result of which the community also suffers from serious health threats, poor sanitation, poverty and other complicated socio- economic problems. Because of rainfed region and saline ground water, situation of project area Bap (Jodhpur) and Jaisalmer are worst. As a part of routine work, women and young girls have to walk miles every day to fetch water for the family in inhospitable conditions. Most of time girls could not go to schools. GRAVIS has been focusing in the areas of water security and improving the living conditions of women and children in the region for a number of years. Over last 29 years, it has done commendable work in many villages in developing rainwater harvesting techniques. Till date GRAVIS has constructed 5628 taankas and has renovated 522 Beries. 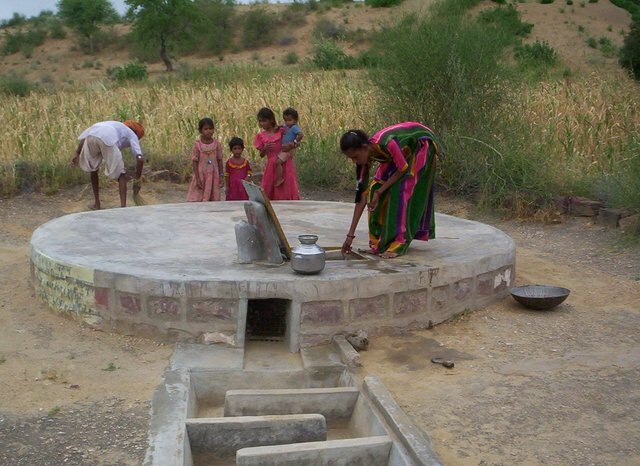 The proposed project will promote rainwater harvesting in selected villages of Jodhpur and Jaisalmer district and will reduce the water fetching drudgery of women and children. It is presumed that estimated number of people who will get safe water will also practice sanitation. Hygiene: 1918 people (directly) will get benefits by using save water. Local employment: 66 people will get wage work during construction and renovation work for 10-15 days (estimated). GRAVIS would like to promotes two rainwater harvesting structures through this project to mitigate scarcity of water in selected villages. Construction of such taankas is a major activity of GRAVIS. A taanka is an underground tank with a cylindrical structure of a 10’ x 10’ size. Around the taanka, a catchment area is prepared which collects the rain water and lets the water pour into taanka through filtered inlets made on the external wall of the structure. Average water storage capacity of a taanka is around 20,000 liters of water. After fully filled, this amount of water is sufficient for a family of 6-7 members for a period of 5-6 months. Moreover, a readily available water source allows families to consume more nutritious food, cultivate their own resources, and maintain a good hygiene. Beries are an important water harvesting technique promoted by GRAVIS. These structures are built into the clay layer of the naadi or khadin, are usually 1-2 m wide, & vary between 2 -12 m in depth. Some beries can hold up to 500,000 liters of water - a year's supply for 10 families. Those beries which are more productive, & thus more permanent, tend to have a raised concrete platform with a covered opening for the convenience of drawing water & to disallow sand & rocks from entering. Periodic silt removal is necessary for beries, especially for those built directly into naadis. The project will be implemented in six months in one phase. Self-reliance is the main vision of GRAVIS and this will not be achievable without active involvement of community. For community participation, it is necessary to involve them in planning & implementation of project. For insuring this, community based organization (CBOs) is an important part of GRAVIS work methodology. Before starting work in new villages, these community based organizations are always formed. The two important CBOs that GRAVIS works with are -Village Development Committees (VDCs) and Self Help Groups (SHGs). The villagers ensuring representation of all castes, genders & religions choose the VDC members. GRAVIS field team orients the members to take active part in implementation & monitoring of projects. GRAVIS always take concern of government department before intervention. Technical inputs are taken during implementation when required. The project will insure water security in project area simultaneously families will be motivated to send their children to schools who were earlier involved in water fetching activities. Health and Hygiene issues will be discussed with community as they are getting safe and clean water at home. The activities of the project focus on water security which is the basic need of the region. Therefore, the community will actively participate in the project. All the interventions of the project are locally suitable, simple and cost effective. With proper care and maintenance, the structures and initiatives can be sustained as functional over the long run. GRAVIS has formed Village Development Committees in each project village who is responsible for selection, monitoring and maintenance of project intervention. Members of Village Development Committees with enhanced capacities should be able to carry on the project work in future. GRAVIS has adequate experience of working with the community in region and will be able to find good support. Community Contribution will be taken in form of labour and local matrial in construction of Taanka and this amount is excluded to project cost requested. How often do the Beries need to be de-silted and renovated? What does renovation involve? Are there ways to prevent the build up of silt? A cleanable silt trap? Thanks. A beri needs a de-silt approximately after every 10 years. The de-silt or the renovation includes excavation of the cavity and taking out the silt. High velocity dust storm in the Thar region lead to this. We have not used any silt-trap techniques in the past, and would be willing to experiment on that. - What are the means and methods that would be employed in renovation/making of beries and taankas? - What is the life of the structures envisioned? - How sustainable is the current option, in terms of its impact to environment? - What are the PH levels of water in taankas and beries made in past? - What are the water filters consists of? - What if there is lime used instead of cement- Do they have locally available materials to make it? How much time it will take? Are the local people conversant of constructing in lime? - Traditionally, is there other methods to conserve water that can cater to larger number? Thank you for your questions Saurin Ji. Here are our replies. The life of the structures is usually long with good maintenance. Beries need renovation/de-silt every 10 to 15 years. Taankas can long very last with very little annual maintenance. The structures are rain-water harvesting, so have only positive environmental impacts. The water filters consist of iron net. Cement is mainly used in construction, as the lime construction is expensive and time consuming. Other larger structures are ponds, but they have a bigger cost and have to be located far from many households. Hello GRAVIS, It is interesting to see th e photos of renovation of age old tankas and beries.I have a point to be understood with respect to water storage.can you please clarify how you are planning to stop any leakage? Are you using any leak proof technique? It is interesting to see th e photos of renovation of age old tankas and beries.I have a point to be understood with respect to water storage.can you please clarify how you are planning to stop any leakage? Are you using any leak proof technique? Thanks. The tanks constructed by us have a solid bottom and walls made of stone and cement. The beneficiaries are advised and encouraged to do an annual maintenance to check and cracks. The catchment area around the tanks may give way to seepage, to avoid which a cement apron is constructed around the wall from the outside. These have worked very well for us. With the number of systems you've installed, it sounds like you have a proven approach. With my experience at Gram Vikas and OTELP, I learned that after tipping point of installing a high number of systems, the government eventually wakes up and joins the movement. With your reputation and strong experience, have you been able to leverage local and state government support for water and related projects? Have you / do you work with government agencies to fund projects, identify sites, raise awareness, and incorporate NREGA and other policies to make them work for your communities? Thanks for your question. We have till date constructed over 5,500 taankas and over 540 beries. So, there has been a long and proven experience. In the beginning, the government did not agree with our approach of constructing smaller, household size structures. But gradually our idea got great acceptance. Currently, GRAVIS is almost on all local government committees focusing on water, agriculture and development. It has also partnered in various govt projects on water including the currently ongoing Integrated Water Resource Management (IIWRM). Our roles in these projects have been of sharing knowledge, facilitating community based processes and technical support. We have also been participating regularly in NREGA discussions as well as other programmes like NRHM and Sanitation Campaign to provide our and communities' feedback on funding, possible activities and monitoring. You have been working for water harvest for almost 30 years, I would like to ask you if there are any changes in the technology of Taanka’s or Berries from the traditional knowledge or new modification has been incorporated. Have you invited any technical colleges or institutes to your field area to get new ideas? Thanks for your questions. Yes, GRAVIS has worked extensively on innovations to improve the efficiency of taankas and beries and to reduce the cost. The innovations have been in the context of design, construction materials and also in the training part. We have received technical inputs from a number of expert organizations including Central Arid Zone Research Institute (CAZRI). Sorry but I know very little about agricultural water demand management. Do the families contribute towards a maintenance fund? Just for my understanding, is it possible to de-silt annually and would it be cheaper to do that, rather then the major de-silting? Madan Ji - thank you. The community contributes to the renovation as well as to the community based funds or village funds which can be used for maintenance and minor issues. An annual de-silt according to us may not be very practical. We can discuss this further with the community. If the beneficiaries are not willing to contribute to a maintenance fund to cover repairs, upgrades and basic operation and maintenance costs (no matter what income level of the family), then PWX should not provide financial and technical support. Thanks for your comment Rick McGowan. I understand your point and we always encourage and ensure a local contribution. There is a clear need in the area GRAVIS is working in and their interventions are appropriate, inclusive. My major worry is population growth. The area cannot sustain a large and growing population and the work being proposed with have short-term impact if the beneficiary population grows. I hope they heed the advice and restore traditional structures with time-tested traditional materials - thus improving the skills of the people in the area to manage their own water systems. Looking at proposal & discussion at Q & A forum shows GRAVIS has huge experience of construction of 5628 tannka & 522 beries. The most important thing is participation of community & GRAVIS is involving in it in every stage. My recommendation is highly positive for GRAVIS proposal. GRAVIS has good experience in technical, and community development , I see the area also needs focus intervention on the other issue , since the projects are covering greater number of community , the integrated approach will bring in comprehensive changes and support for the development of the at area with the time and budget limits, also with local mobilization ( eg: looking on childlabour issue , child marriage , women health issues , youth life skill... and any other with- in your observation and need).Also suggest to plan for withdraw strategies once GRAVIs role is not required and parallel system is created among community themselves. Good wishes for your Project. Though no experience in this field, but i found both design as seen in picture and comments by other experts good learning for our work in Dethali. I will be sharing this with our village too. Based on the application information and Q&A forum, I am impressed with what appears to be extensive experience and thoughtful use of traditional yet workable technology that Gravis has to offer. The water solution seems appropriate for the environment and conditions. I recommend that the application be funded.